Mario Galento’s real name was “Bonnie Lee Boyette” but he went by “Butch” because he worked as a butcher..
~~~On an interesting side note: He always loved listening to Johnny Cash – especially “Boy Named Sue”! ~~~Boyette’s parents names were Emma & Cecil, and his mother survived a horrible illness from the Influenza Epidemic..
~~~He had 2 brothers, Billy & Wayne and 1 sister, Jewel. His siblings called him Big Bud. ~~~Boyette married Marie in 1936 and they had a son, Robert (1937) who tragically passed away from being premature..
~~~The Boyettes had a daughter, Barbara (1940), and a second daughter, Terry ()..
Mario Galento wrestled a lot in Tallahassee, Florida back in the 50’s & early 60’s. 1965: Jesse James pulled an upset victory by pinning Georgia Heavyweight Champion Mario Galento..
1965: Mario Galento defeated Jesse James the following week to retain the Georgia Heavyweight title..
Mario Galento owned Mario’s Pizza & Italian Food restaurant in Marietta, Georgia..
Mario Galento stated that he had been through rehab and wanted to make inspirational films to be shown in churches..
January 6 ,1989: Mario Galento died at the age of 74 as a result of liver disease..
Mario Galento had sizable co-starring roles in two films, Frontier Woman in the mid 50s and Natchez Trace in 1960..
May 2 , 1994: Mario’s daughter, Barbara Gallento (Real Name: Barbara Reeves) died as a result of Pancreatic Cancer..
Terry Boyette (Mario’s daughter) wrote: I was born in 1958 so I was very young during his heyday and some of my memories aren’t so clear. But I do Remember one of his gimmicks was: he Always took a hand towel to the ring and tied it in his corner. At a time when it looked like he was losing his match, he would grab that towel, wrap it around his fist and pummel his opponent. Oh yeah, there was a time when he would clip a clothes pin under his long hair and use that like brass knucks. His signature ‘finishing’ move was the hangman’s hold. Of course there were a number of ‘feuds’ but I believe one of the most notable was with Buddy Fuller in the Atlanta area in the mid 60s. I also remember my father taking me with him to various wrestling ‘offices’ in the south. We would see Lee Fields and Bobby Fields. At one time, when we lived in Lilburn, GA (outside Atlanta), our houseguest was Silento Rodriguez and his family. Jackie Fargo & Sputnik Monroe were visitors in our home from time to time. Grady Robinson wrote in from Iraq: A VERY good day to you and your staff. THANK GOD I found you. My name is Grady Robinson, my ring name was Jackie Kane. I was trained by Mario well I began my training when I was nine years old, my brother was 8. I have travelled MANY, MANY miles with Mario as well as his beautiful wife Smoky. I first met Mario through my dad who would drive him to his bookings. Mario needed some kids for a match to be held in Sykston MO. He ask my dad “Hershel Robinson” if Donald “my brother who has since passed away I am so sorry to say” and I could take part. The promoter was a very good man named Henry Rodgers. As with Mario he always wore the best cowboy boots. I am not sure to be honest but I think the name of the movie was from bar room to pulpit. My dad was a minister. The last I heard from Smoky was over the phone MANY years ago, she was living at that time in Fla. GOD the stories I couold tell. At any rate I was trained by Mario for many many years. This was in Memphis, TN. Mario and Smoky were like a second family to me. Yes I remember meeting his Daughter Terry. I doubt she would remember me it was so many years ago. I think my best memories were when Mario took my brother and I to Miami Fla. where we had a booking. That was my first plane ride. I would LOVE to hear from Smoky again. I am now 45 yrs. old and still think of the times and MANY miles we all spent on the road together. PLEASE if possible forward this to Smoky and / or Terry ask them to PLEASE email me. I am in Iraq now and do not have access to phones as far as recieving call’s. I can make call’s however. My main email is [email protected] THANK you so MUCH in advance. diamondmd (from the Kayfabe Memories Forum) wrote:Mario was born and raised in Tennessee and left home as a teenager to hobo around the country. He was nearly 30 years old when he became a wrestler in the late 1940s. He first hit the GC in 1953 under his real name Butch Boyette (actually his first name was Bonnie, Butch was a nickname from a former occupation as a butcher). 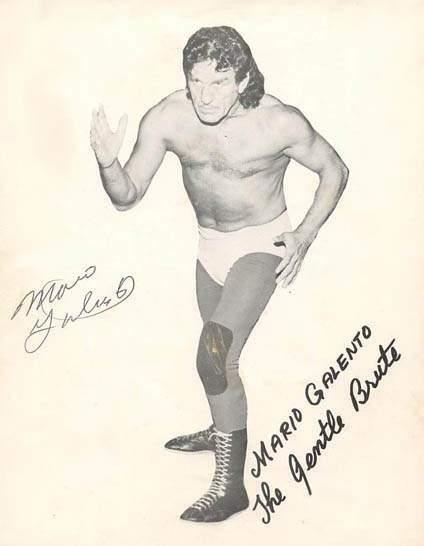 He returned as The Masked Flash in 1954 and when he was unmasked he was ID’d as Mario Galento and that was the name he used for the remainder of his career. He was given the name by Al Galento and they teamed off and on, but really didn’t get along that well. Besides the GC, he was a major name in Texas, Tennessee and Georgia with some minor tours of Florida and the Northeast as well. He held titles all over the South, both singles and tag team. As far as his style he was basically a brawler, and although he wasn’t a shooter by any means, he had a reputation for being pretty tough. He was unique for his day because he wore long hair and earrings. As far as his mic style, he was a tough talking braggart both as a heel and as a babyface (which he worked one way as much as he did the other). The most dangerous part about him was his second wife, Smokey, who served as his valet. She was not smart to the business for a long time and was known to pull a gun on Mario’s opponents if they got the better of him. Robert Louis Howell wrote: Mario Galento was supposed to have acted in the films Natchez Trace and the Daughters of Davey Crocket. Galento had an Autobiography of sorts for sale titled The Gentle Brute. The Galentos last match in Atlanta was his and the Super Assailants loss to (and unmasking by) The Assassins and the Super Protege. The week prior Galento had his swan song on Atlanta Wrestling TV teaming with Tex Mackenzie against Big Tex (Stan Frazier) And Assassin 1 (Tom Renesto) Renesto held Galento for Big Tex to hit and Galento ducked. Mackenzie fell off the ring laughing but Galento got the pin and exited without a smile. Big Tex just looked bewildered.